Martha Washington’s Booke of Cookery and Booke of Sweetmeats: being a Family Manuscript, curiously copied by an unknown Hand sometime in the seventeenth century, which was in her keeping from 1749, the time of her Marriage to Daniel Custis, to 1799, at which time she gave it to Eleanor Parke Custis, her granddaughter, on the occasion of her Marriage to Lawrence Lewis. In its most recent form, the manuscript has been wonderfully interpreted and transcribed by Karen Hess, a noted American culinary historian. The manuscript contains two books—the first is called the Booke of Cookery, the second is called the Booke of Sweetmeats. It’s a fascinating look at early American cooking, and Karen’s insight into the time period is invaluable in helping us understand the context of the recipes. 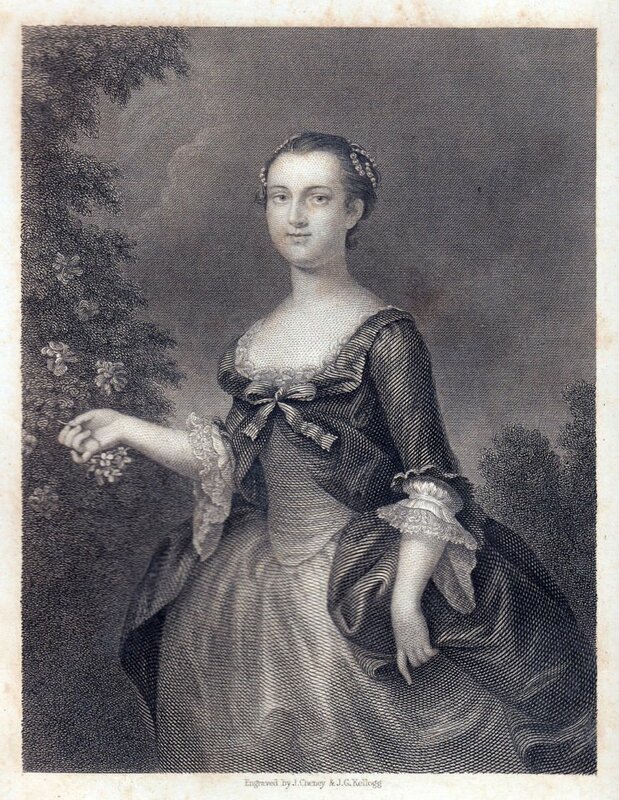 Martha Washington was born Martha Dandridge, the eldest daughter of a Virginia plantation owner named John Dandridge. At 18 years old, in 1749, she married a wealthy planter named Daniel Parke Custis who was two decades her senior. She was given this cookbook manuscript during the first year of her marriage, presumably as a wedding gift. 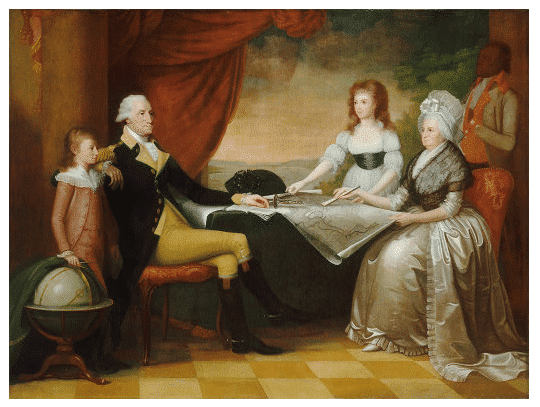 Martha and George never had any children of their own, but Martha did have four children with her first husband John; their names were Daniel, Francis, John (Jacky), and Martha (Patsy). Daniel and Frances died in childhood, while Jacky and Patsy only survived to young adulthood. Patsy died of a seizure at 17 years old. Jacky married and had two children before his death in 1781 at the age of 26. Martha and George raised Jacky’s children after his death. Martha eventually handed down the cookbook manuscript to Jacky’s daughter, her only granddaughter, Eleanor Parke Custis. 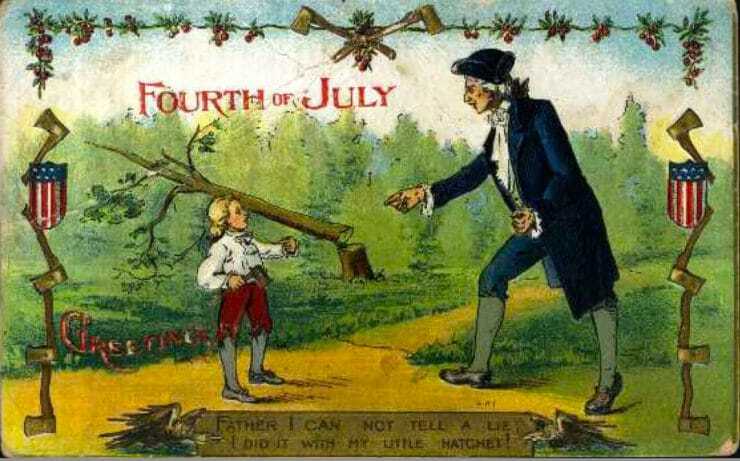 George, said his father, do you know who killed that beautiful little cherry-tree yonder in the garden? This was a tough question; and George staggered under it for a moment; but quickly recovered himself: and looking at his father, with the sweet face of youth brightened with the inexpressible charm of all-conquering truth, he bravely cried out, “I can’t tell a lie, Pa; you know I can’t tell a lie. I did cut it with my hatchet.”–Run to my arms, you dearest boy, cried his father in transports, run to my arms; glad am I, George, that you killed my tree; for you have paid me for it a thousand fold. Such an act of heroism in my son, is more worth than a thousand trees, though blossomed with silver, and their fruits of purest gold. Sweet story… however, most historians agree that it likely never happened. However, George Washington did have a particular fondness for cherries (and fish, too)! 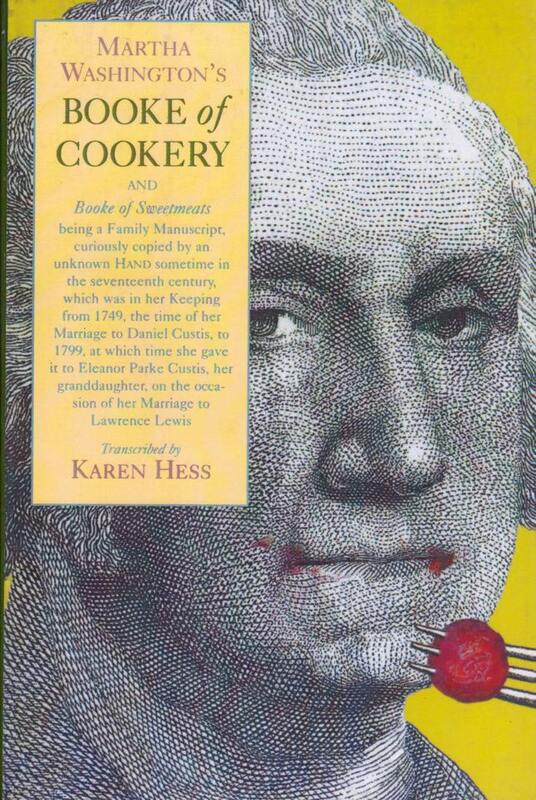 No big surprise, then, that Martha Washington’s Booke of Cookery has several recipes for cherries, including methods for making cherry preserves, cherry wine, and cherry paste (fruit leather). 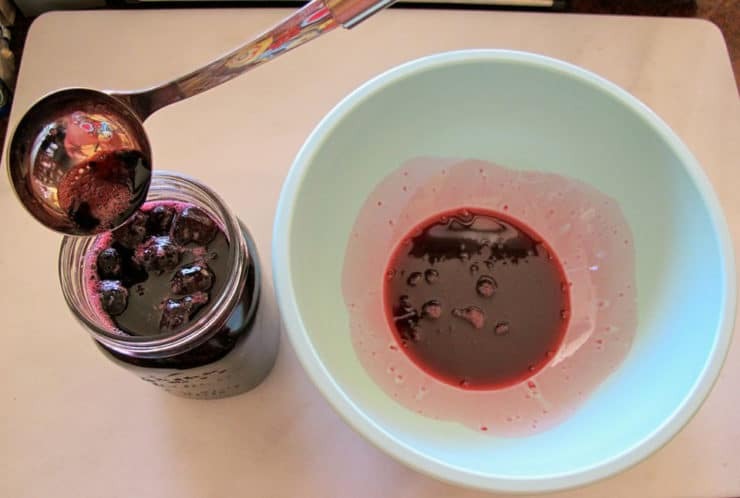 For today’s blog, I chose a recipe that is the historical equivalent of preserving cherries in heavy syrup. 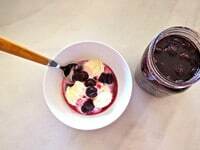 It does not make a spreadable jam or jelly; rather, it extends the shelf life of the cherries so that they can be consumed or used in recipes. Sugar has been used to preserve fruit for centuries. 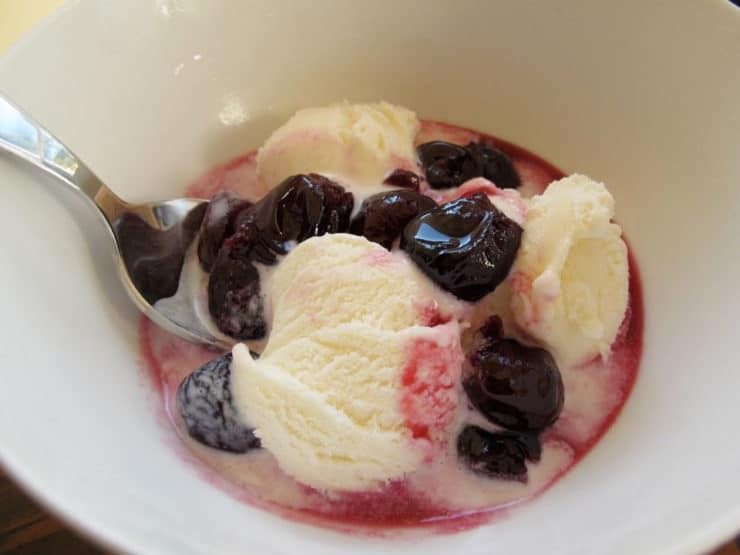 Sugar-preserved cherries can be used as a topping for ice cream, blintzes, or cheesecake. They can be used as part of a pie filling or blended to make jam. You can thicken the juice with a little cornstarch dissolved in water to make a yummy sauce for cake or bread pudding. The syrup that forms during the boiling process has a lovely flavor, which can be used to sweeten beverages. 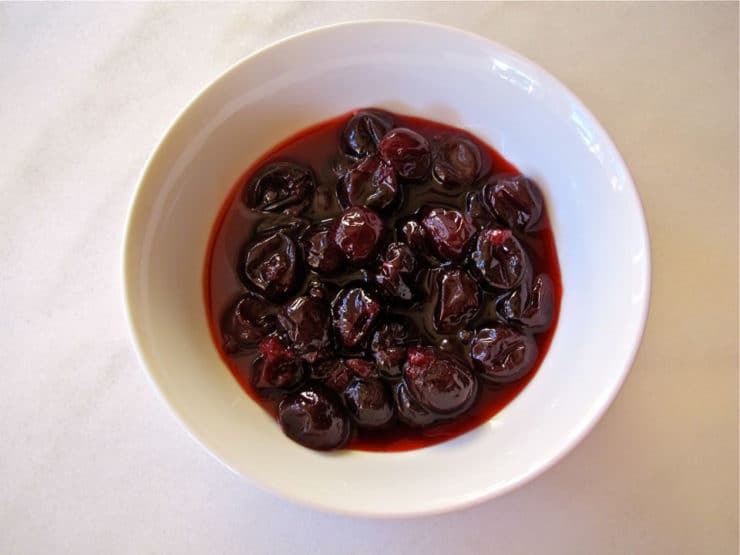 Preserved cherries make a great substitute for less healthy maraschino cherries (which contain food dyes and preservatives), and may be added to cocktails whenever a maraschino is called for. The syrup can even be added to Coca-Cola to make homemade Cherry Coke. Take 2 pound of faire cherries & clip of the stalks in ye midst. then wash them clean, but bruise them not. then take 2 pound of double refined sugar, & set it over ye fire with a quart of faire water in ye broadest preserving pan or silver basen as you can get. Let it seeth till it be some what thick, yn put in yr cherries, & let them boyle. keepe allwayes scumming & turning them gently with a silver spoon till they be enough. when they are cold, you may glass them up & keep them all the year. Karen Hess did not really “translate” this particular recipe in the book, so I used other recipes she broke down as examples. This one was pretty self-explanatory, and it produced a delicious result. Yes, it’s a lot of sugar, but these cherries aren’t meant to be eaten in large numbers. Rather, they should be added sparingly to desserts and drinks as a way of enhancing their flavor. Enjoy! 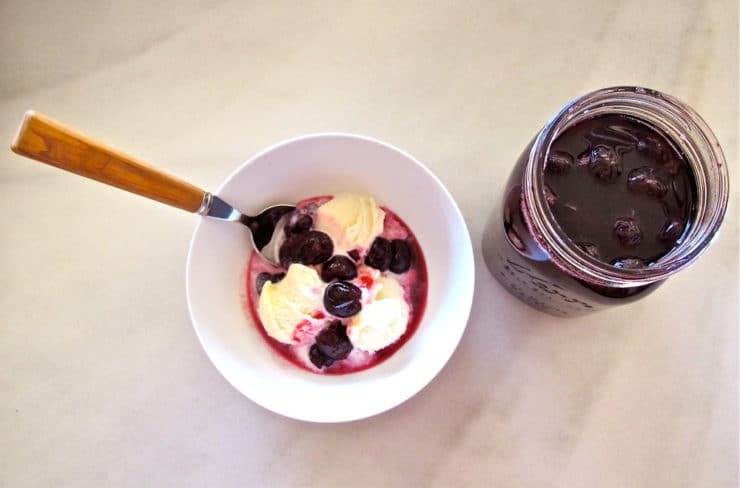 Note: If you plan to can these cherries for a long shelf life without refrigeration, you will need to follow a sterile canning process. Click here for details. Or, you can simply store your cherries in a jar in the refrigerator. How to preserve cherries in sugar syrup using a historical recipe from Martha Washington's Booke of Cookery. George Washington's favorite fruit was cherries! 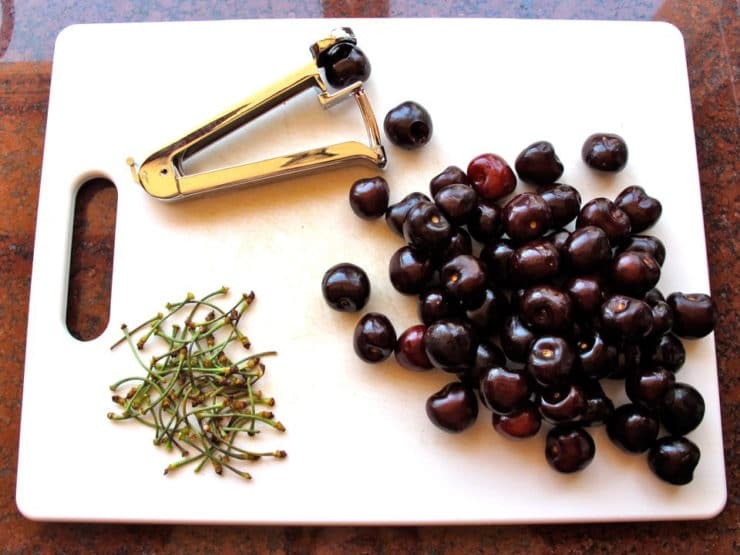 Wash and dry your cherries, then pit them using a pitting tool. Discard pits and stems. 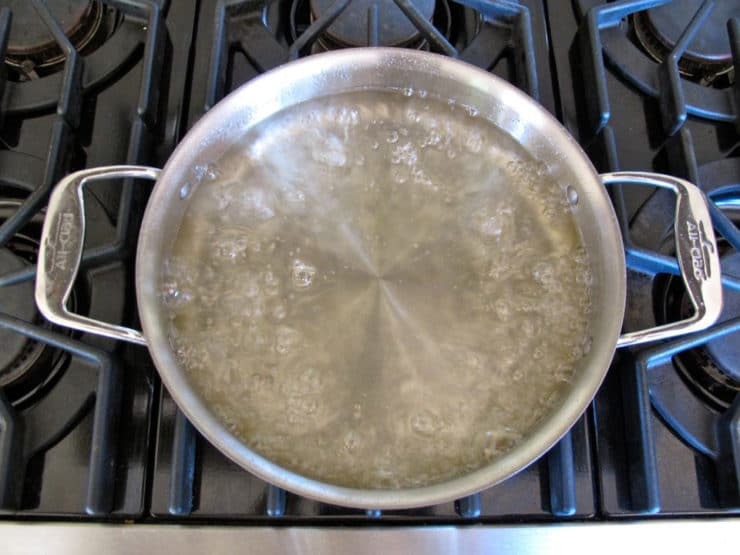 In a wide sauté pan, sauteuse, or pot, pour sugar and water. Stir constantly over medium heat till mixture comes to a boil. Boil the sugar water for 10 minutes till it begins to thicken slightly into a light syrupy texture. Pour cherries into the sugar water. Bring mixture back to a boil, then to a simmer. 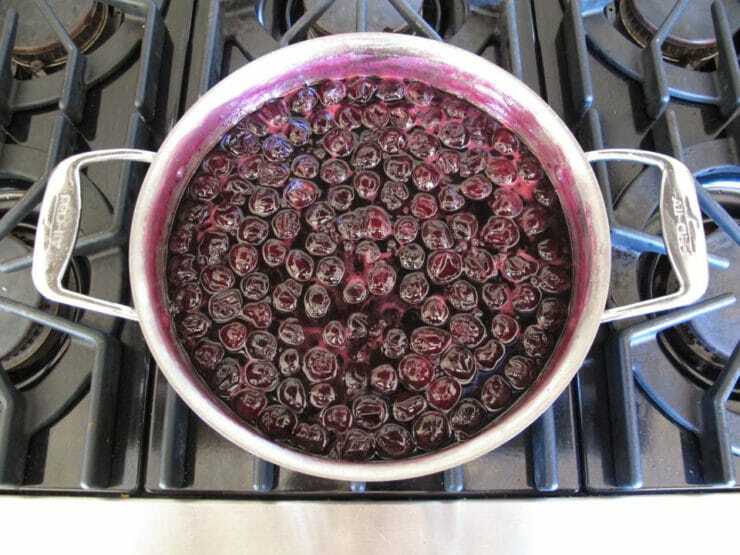 Let the cherries simmer for 20-25 minutes, stirring them gently with a metal spoon as they cook. As foam develops on the surface, skim it periodically with a spoon and discard. This will also help to reduce the liquid in the pan. 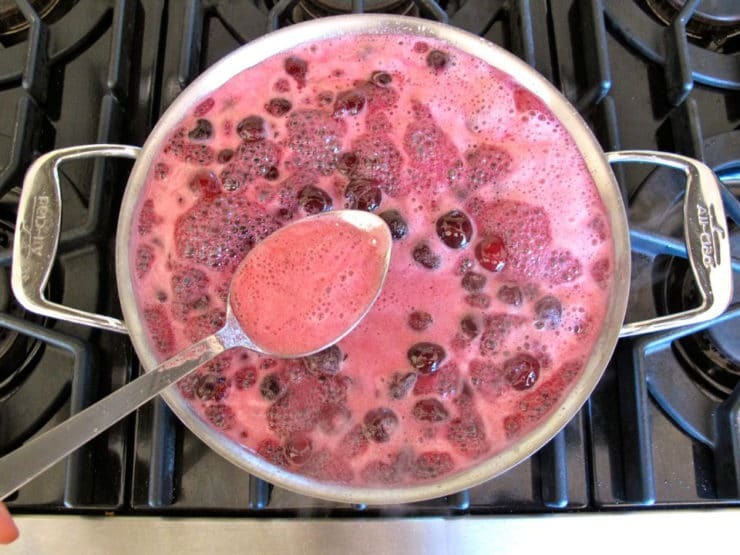 When cherries are tender and the juice is thickened and reduced by about half, remove from heat. By now there should be little or no foam on the surface of the liquid. Let the mixture cool to room temperature. Place the cherries in a sterile glass jar and cover with juice. Seal tightly. Store in the refrigerator. 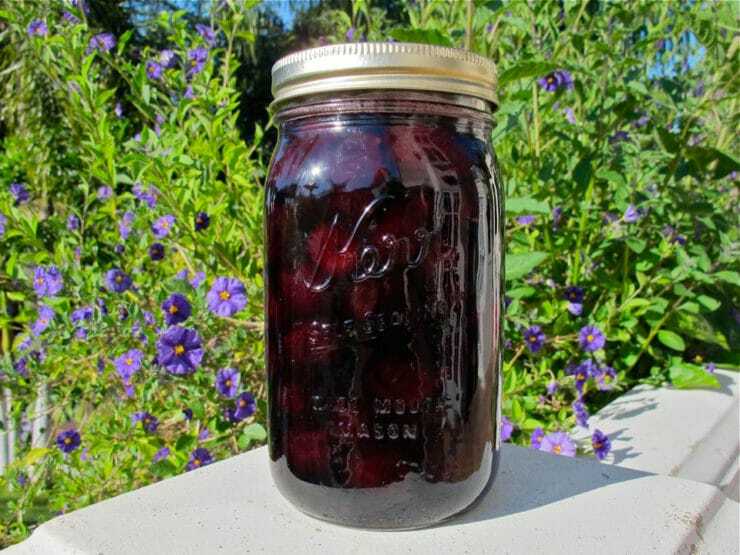 Alternatively, you may jar the cherries using a sterile canning process. 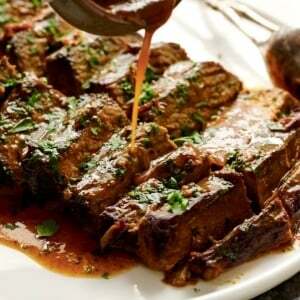 This will prolong their shelf life and allow for storage outside of the refrigerator. 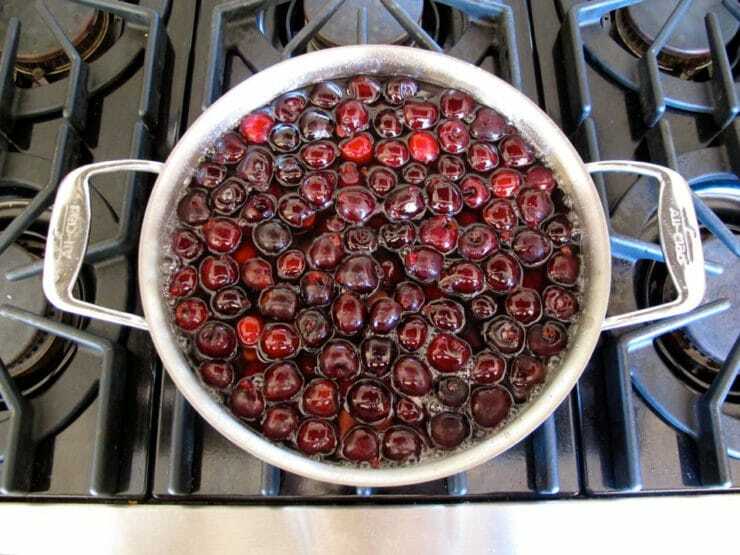 Some of the many possible ways to use preserved cherries: as a topping for blintzes or cheesecake; as part of a pie filling; thicken with cornstarch to make a sauce for cake or bread pudding; to sweeten and flavor beverages and cocktails; as a substitute for maraschino cherries. I like to use them as a topping on vanilla ice cream. Delish! Cherries are on sale now in NC and are my favorite. Going to store to try this. Thank you so much. Will have to buy a copy of cookbook. I collect them. Looks like something I will try. Hi, Tori. 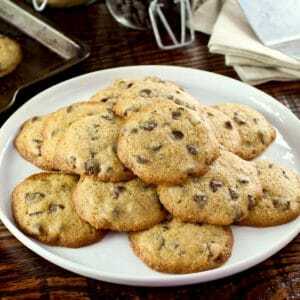 This great recipe reminded me how wonderful taste everything you can make from scratch. Thanks for that! Back in Russia, we used to make preserves from all different fruits. Cherries with pears were my favorite. But here, I was never able to find cherries which can be used as preserves. I live on the East coast, where can I found them here? I will wait for your answer, Tori. Thanks in advance. I think you mean to write – Martha and George raised Jacky’s children after his death. You statement is – Martha and George raised Jacky’s grandchildren after his death. Correct! Thank you Jerry, I have updated the post. Wow, this was perfect. I used this recipe to start a Summer Cherry Delight recipe I was making. This was the base and the was perfect in the recipe. No more buying canned cherries for this girl. Thanks! Making these for the 4th, we were looking for a natural way to make marashinos. Thank you for the history behind them. hi tori when did you start this website found it while i was just surfing around. which camera did you take the great pictures with? I’m so glad to have discovered this. I once had an Old Fashioned that was out of this world, and the secret was the preserved cherries they used. Many thanks! I collect old cookbooks like this – what a treasure. You chose a great recipe to showcase, and very timely too. I think I’d douse them in brandy and wouldn’t worry at all about the sterile canning process – they wouldn’t last that long! You did a great job with it and I am kinda glad that you did not go to whole nine yards of canning process. As long as you keep it in the fridge, it is ok right? I used to mix the syrup from my grandma’s jams into mineral water to make myself a “drink” when I was a kid! 🙂 This post reminded me the good old jam making sessions! Neat! My aunt does all of our genealogy stuff and supposedly we are related to Martha in some way down the line… I will have to look into this book! Always interesting reads! 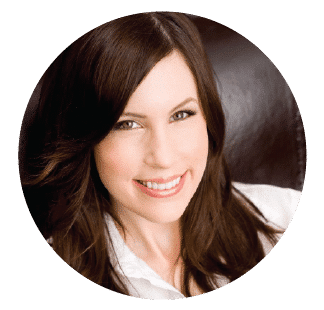 Love your articles! Wow Cynthia, what an awesome branch to have on your family tree! Reading through this cookbook was a trip, I highly recommend it for all who are interested in food history. Thanks for reading! Here in Seattle we get tons of fresh cherries so I’ll be trying this recipe for sure! Happy 4th!! I wonder if C & H superfine sugar would be just the right consistency when making this delectable recipe. I use it is cheesecakes it makes them so smooth. It is packaged like a carton of milk so you can pour out of it. It is a tad more spendy but worth having in your cooking arsenal. Wow…..wowza! Double, triple Wow! Those look amazing – my husband HAS to be a direct descent of our first president he l-o-v-e-s cherries and if I don’t make these for him…well, I don’t want to see a grown man cry! I absolutely love the history you included in your post! This was my favorite post of the day! I have only one question….do you think it’s possible to use Splenda? Maybe a mix of half Splenda & half sugar? I am seriously watching my sugar (docs orders) and would hate to miss out on some myself! Hey Ann! Thank you so much, what a sweet comment! Yeah, there’s a TON of sugar in this recipe. 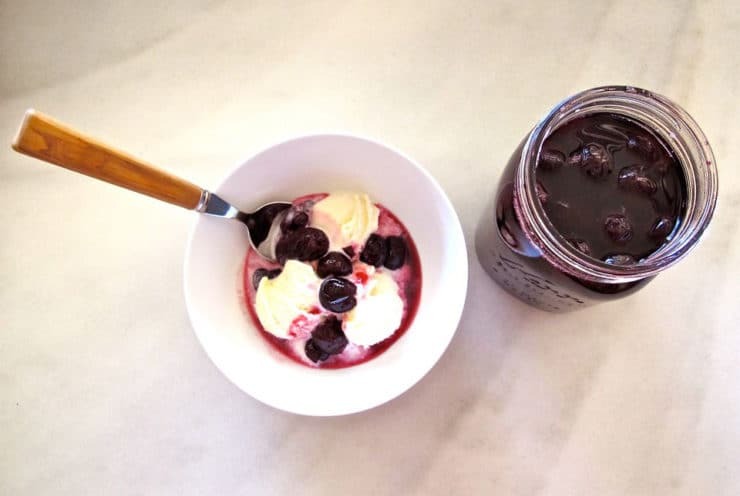 But you can actually cut the amount in half to make a lighter syrup, if you want… cherries can be preserved with relatively little sugar, this recipe just happens to call for a heavier hand. Try halving the sugar and use 3 cups of water instead of 4, that should do the trick. I wouldn’t entirely sub Splenda, only because it doesn’t preserve or create a syrup like sugar does… but if you’re not canning this and plan to store it in the fridge, by all means substitute half Splenda! I love this so much! I write a piece for the Glendale, CA Examiner on local Farmers markets and if they have cherries in Montrose this weekend, there is a good chance I’ll give this a try for this weeks article! I love the idea of vintage recipes, such a great way to connect with history, although I’m sure Martha Washington didn’t have the benefit of that beautiful All-Clad pot! You’ve found the key to my heart. Love,love,love cherries. Going to have to go nab some this weekend. Saw some at the grocery store but they wanted you to have to sell organs to afford to buy them. Hoping I can find some at the market. Wow! This looks so easy and so delicious. I’m going to the farmers market today and I’ve just added cherries to my list. I’ll let you know how it turns out.